First blow molds still had lots of sizes and dimpled knees. T-series heads. Then knees got smoother and a lot less detail elsewhere on body too. look just like first blow vinyl Ruthies but body features are smoothed out (less problem in molding process I highly suspect) . Most conspicuous difference is smoother knees. Arms and legs are even lighter than first much much lighter than blow vinyl I , you can squeeze them and they "give" [thinner and thinner and thinner it seems]. Uses the same head marks: T-14, T-16, T-21, T-27. Also has even increments of heights - 14", 16" 18" 20". 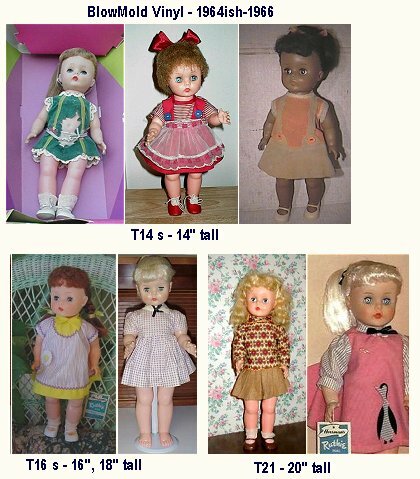 T27 is very unusual in these dolls, in catalog she is called "My Baby and Me" and came with her little 8" LAL babydoll. See Large Dolls.